Ceviche – Yes, You Too Can Make It! We ate a lot of well-cooked seafood last week on vacation in Brussels and Edinburgh so I thought I’d keep it going this week with some ceviche for our stay-home date night. Trust me when I say: everyone can make this. It is almost foolproof. And absolutely delicious. If you’ve been following this blog for any amount of time you know seafood dishes are few and far between. Since I write about what I cook and create you can safely guess seafood isn’t often a main entrée. One reason is we live in Chicago, a.k.a. ‘Hog Butcher for the World’ so I have plenty of pork to work with for sausages, roasts, etc. Another reason is Cheryl’s not the biggest fan of fish. I’ve been working on that and we’ve figured out it’s really the oily fish, like salmon, which are turn-offs. That said Cheryl’s palate does lean towards fresher, rawer, flavorful uses like sushi, tuna tartare, and ceviche. It’s not surprising since cooking fish (or let’s be honest here, overcooking fish) can change the taste by releasing oils and give it a very ‘fishy’ flavor. What is ceviche? Originally a Peruvian dish made by marinating pieces of fish with lime juice and flavored with aromatics. The citric acid in the lime juice breaks down the proteins in the fish, ‘cooking’ it. Of course there are different variations throughout South and Central America but like anyone who claims to be the originator, the Peruvians take a very French approach to ceviche as in ‘it must be made this way and this way only.’ Some ceviche get overloaded with seafood like clams and shrimp but I do like the simplicity of using just one type and flavoring accordingly. In restaurants you’ll often see ceviche served with some sort of crispy flatbread or cracker to help give it texture. For this recipe I added some crunchy vegetables, chopped cucumber and poblano peppers, instead. This particular ceviche does not adhere perfectly to the Peruvian one but I think it’s more about the technique and the speed with which this dish comes together. Slice up the fish and while it’s marinating prepare the remaining ingredients. One important factor in making ceviche is you need to have really fresh fish! Quality of the main ingredient is imperative so use a source you trust. Also while you may not have an awesome spice shop near you like me (Savory Spice in Lincoln Square, Chicagoans) try to find some spices to add. 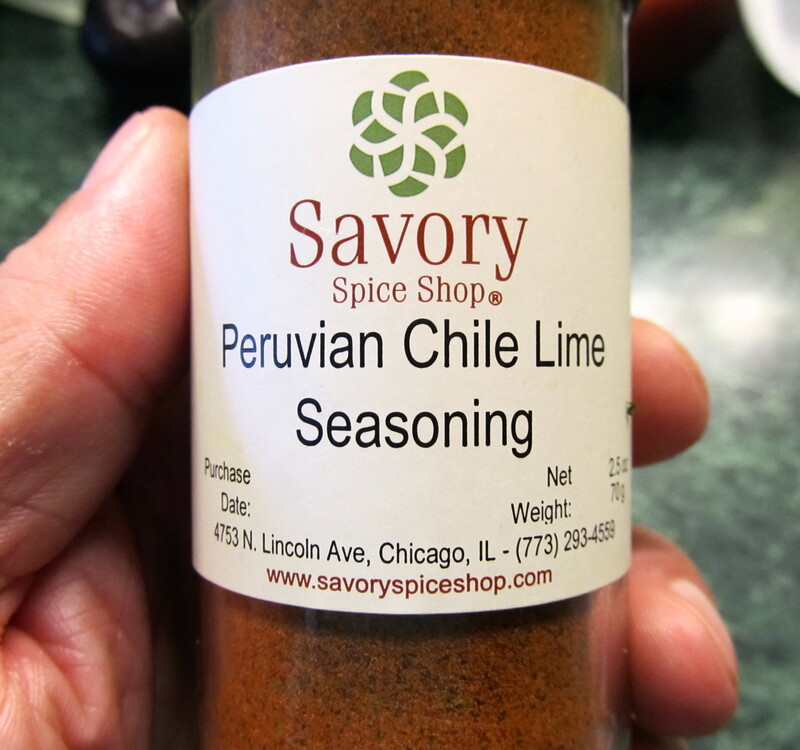 I found a ‘Peruvian Chile Lime’ blend which has some cumin, chili powder and aji amarillo chiles in it. If you’re feeling really adventurous, drink up a small shot of the marinade, leche de tigre, like the Peru cevicherias serve. And in case you’re wondering…I could not convince Cheryl to do this (in fairness, I didn’t either). Small steps! Slice the fish into thin bite sized pieces. Mix with the lime juice and red onion. Place in refrigerator and allow to sit for 30-45 minutes. Mix in the remaining ingredients. Season to taste. Serve with lettuce leaves. Previous Post 48 Hours in Brussels – Mussels, Beer, and World Cup! Very nice! Cod is on the ‘good’ list since it is very mild. 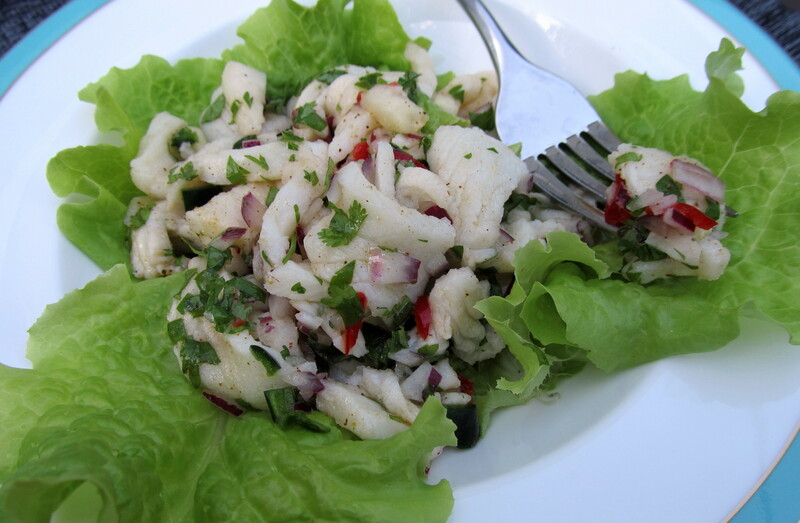 love ceviches, what other fish do you reckon it works with? This was really good, and ridiculously simple! I’d recommend non-oily firm fleshed fish, like sea bass, snapper, striped bass, sole, flounder. You can also make it with shrimp, scallops, and clams. I have never made ceviche – mostly because I live in Oklahoma. But your post is inspiring! As long as you can get quality fish you can do it! That and limes. Yum! What a perfect and easy summer dish. It really is! And quick too!